If you love what you do, you’ll never work a day of your life. Happy holidays and happy new year to all you foodies out there. This article is a dedication to the owner of Textures of the Soul; Deborah Davis. Deborah is a cousin of mine based in Georgia and clearly has a passion for her leather and her products. The moment I approached her about a knife bag, she instantly got excited. She had never done one before and decided to take up the challenge. Every few days we spoke about my current bag and what we would do with the knife pocket & strap measurements. I couldn’t believe that we were moving forward with it, I was so excited. When she sent me pictures of the leather and I saw the colour I was so happy, never had I done this before, so it was all an experience. There is nothing better than getting pictures of the progress, knowing that it’s your personal bag. When the bag was done I was very pleased with it and told her I couldn’t wait to get it, so I could do a review. I have the bag and it is a beauty. 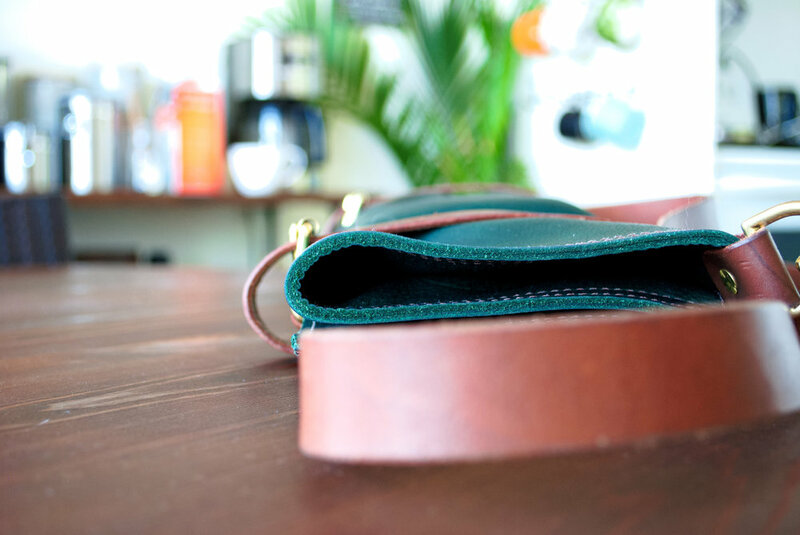 Such a gorgeous green, the light brown straps, the stitching. You can tell that this bag was made with love. The design is great, the pockets for the knives are tight and aren’t loose like most bags. The golden buckles give a nice contrast with the green bag and brown straps. The horizontal flap covering the blades provide extra protection. The cover has a tiny buckle at the end that secures it in place, also prevent any blades from slipping out the bag. Many times, I have had knives slip out my bag because the cover wasn’t made properly. If you are a chef and love your leather and want a great bag made from top quality products I recommend you check out Textures of the Soul. They also have an Etsy page which you should definitely check out.